Let’s talk about the books we have been reading. And NOT reading. But before we do that – and before you give some suggestions for GOOD books to read, because, as will be perfectly clear in about 4,000 words, I have faced a real Dearth of Good Books lately – let us digress a little to discuss one of the major differences between me and my husband. My husband and I both LOVE to read. We are both the type of person who buys a stack of books and then starts looking for the next book to buy while we’re not even done with the first book in the stack. We are also both the type to read multiple books at a time. 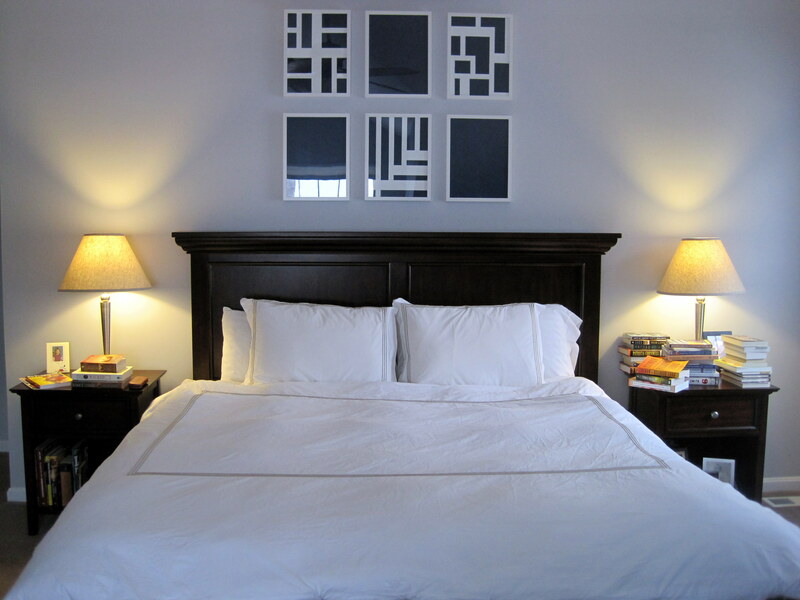 Here is a photo of our bed and nightstands. See if you can spot the difference. Welcome to our boudoir. The duvet cover always looks lumpy but at least the bed is made. So, my husband may read as many as three books at a time. I think, right now, he’s reading the second in the Game of Thrones series (so we can get started on season two of the TV show FINALLY). He checked out some book from the library recently, which I think he may have started. I can’t remember if he’s started Wicked or if he’s saving it until after he finishes the other(s). He may also be reading something on the Kindle, and, occasionally he “reads” a book on tape while he’s driving to and from work. Anyway, my husband’s nightstand is neat and clean. Aside from the few books, it holds a picture of me as a child that he has deemed especially cute, a recent issue of Consumer Reports, and a book of puzzles. 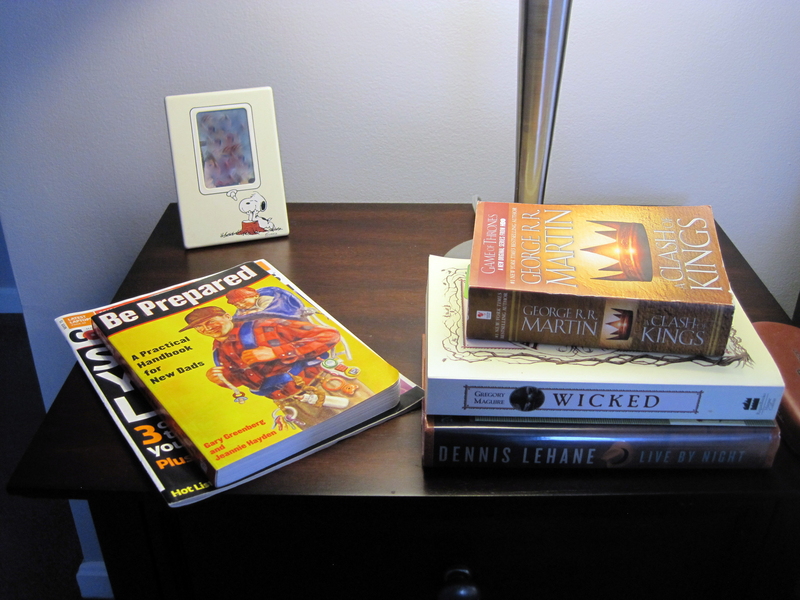 My husband’s top-of-nightstand contents: reasonable and not in danger of falling on a person in the night. 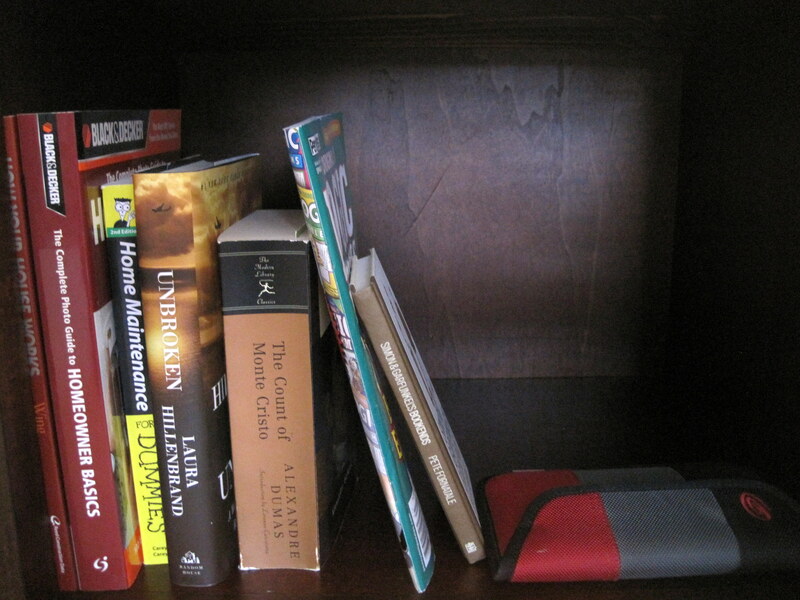 He keeps reference books (and the aforementioned Kindle) in the open cupboard portion of the nightstand. There are also two books I’ve recommended to/bought for him that he hasn’t yet begun. Two of my husband’s favorite things to do are to a) pick the next book he is/I am going to read and b) put away books that have just been finished. It’s one of his most endearing quirks – in fact, I think I’ve mentioned it in this space before – that he loves the task of rearranging our bookshelves to accommodate new tomes. I’m not sure why; the simple logic of alphabetization, perhaps? The chance to go through all the books he has and hasn’t read? A combination of both? It’s nice for me. 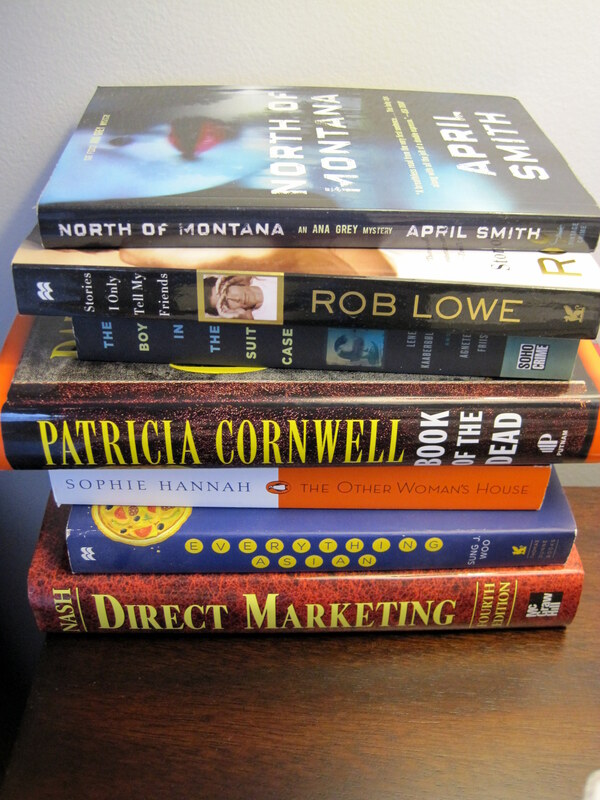 I never have to set foot in our (tiny) “library” – or even get out of bed if I need something new to read. But he has been frustrated with me the last few months. Because I have been collecting books atop my nightstand like it’s the only book storage space in our entire house. You can’t even see the pictures on the nightstand, there are so many books in the way. So, Internet, it has been an off few months for books. Sure, I’ve found a handful I really enjoyed. But the majority of books I’ve started have been stinkers. Yet… I can’t bring myself to just… quit. Which is odd. Usually, I have no problem deciding that a book just isn’t working out for me, and closing it and putting it out of my mind. Maybe my recent reluctance has to do with the high hopes I had for the books in question? Agent 6 is the perfect example. I devoured Tom Rob Smith’s first two books – Child 44 and The Secret Speech – and couldn’t WAIT to get my hands on Agent 6. And then it was just kind of… boring. So I’ve been halfway through it since… August? July? Who knows. But because I was so in love with the first two, and had such high hopes for this one, I just can’t GIVE UP, you know? I haven’t finished a single one of these. Well, except Five Patients, which I’ve read several times. But couldn’t finish on the last go-round. 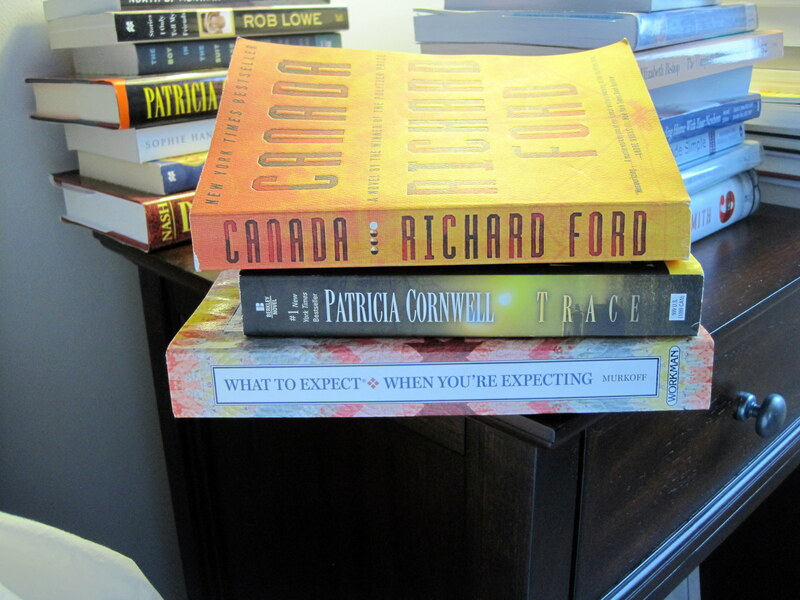 I was a HUGE Patricia Cornwell fan my entire teenager- and college-hood. Her Scarpetta series was one of my all-time favorite mystery series. Until 2005. That was the year that she made an appearance at a St. Louis Barnes & Noble (or Borders?) and my then-boyfriend and I went to see her. She gave a little speech and then signed books, and we got our photo taken with her and I bought a copy of her newest book (signed) to give to my father. Her newest book, at that time, was Blow Fly and it was a departure from her normal writing style. No longer first-person, but third-person omniscient. I gave up reading her books until this past Christmas, when my husband’s aunt (my aunt-in-law?) gave me a Patricia Cornwell book that was a few books further down in the series. And I read it and enjoyed it! It wasn’t as good as I remember the original books to be. But it was WAY better than Blow Fly. So I decided I needed to get back into the series, and to really do so PROPERLY, I had to read all of the books between Blow Fly and whatever book I got for Christmas; I can’t honestly remember. It may be one of the ones on my nightstand WHO KNOWS. Anyway, I read a couple of them – Book of the Dead and… something else – and now I’m trying to read Trace but it’s SO BAD. The primary plot is dragging along like an overweight three-legged alligator and there are a couple of secondary storylines that haven’t intersected with the main plot yet… but you know they WILL, and there are only so many pages left in which they CAN, so I anticipate that there will be a sudden flurry of tying-togetherness that will seem haphazard and sloppy. Plus, one of the main characters of the series has morphed into someone fairly unlikable and I’m not really appreciative of that trend. Honestly, none of the main characters seem all that likable right now – like Cornwell is focusing so hard on making them flawed heroes that she forgot to make them relatable. And what else can I complain about? Oh yes, the WRITING. It’s as though Cornwell had an outline sketched on a cocktail napkin or something, but when she sat down to flesh it out, she didn’t have enough meat, so she’s filled in entire paragraphs with meaningless repetition and “character development” that makes me hate the characters. So that’s why I haven’t finished Trace. It’s still on my nightstand because I feel DRIVEN to finish it, though, and finish the other intervening books between the god-awful Blow Fly and whatever book I read in December. But feeling driven to finish a book and actually plowing through to the end are two wholly different things. There are two Thursday Next books on my nightstand. I started reading one a while ago and had the sinking feeling that I’d read it before. I couldn’t actually remember what HAPPENED in the books, thinking ahead… but as I would be reading along, I’d feel strongly that everything was happening as I knew it would. Very odd sensation, to not know what was coming around the bend of the next page, but to know, when it happened, that you weren’t surprised in the least. I am explaining this very poorly. It was like book déjà vu. There. Right now, I am reading Canada, which I am thoroughly enjoying. (After all, it does take place in a part of the world very near to where I grew up.) The plot – while elongated – is engaging and most of the book is contemplative in a way that makes me actually THINK about what the author is getting at, and there’s a lot of nice description and character development of interesting, flawed-yet-relatable (mostly) characters and, well, it keeps me awake far longer than most books have of late. So that’s SOMETHING. A good book, a bad book, and a terrifying book. So that’s on top and nearest to the bed, which means I am less likely to plop it down as my eyes are growing heavy and tip a entire pile of books off the edge of the nightstand, which has happened oh about twenty times in the past few months. 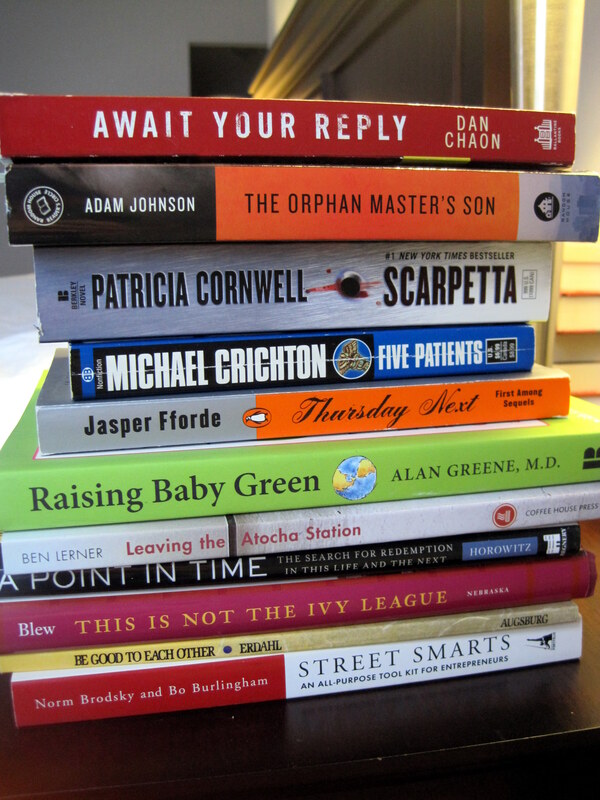 Most of the other books on the nightstand are not really the kind of books you read all in one go. Kind of a random assortment, isn’t it? You pick them up on a night when you’re not in the mood for serial killers (although, when am I not in the mood for serial killers????) or literary fiction, and read a poem or a chapter until your mind is either settled by soothing rhythms and sounds or set a-racing by the terrors of child birth/rearing so that you must turn, instead, to Trace, which puts you asleep almost immediately. The last pile on the nightstand has NO REASON to exist. I did NOT like Everything Asian. But by golly I FINISHED IT! Well, to exist on my nightstand, that is. Are they still there to remind me that a) I AM capable of finishing books and b) good, readable books DO exist? Who knows, Internet. Who knows. Now is your chance to shake yourself out of the stupor that this long and ridiculous post has undoubtedly forced upon you, and recommend some other books for me to read. And, while you’re at it, books I should NOT read. I’d rather not ADD to the pile, you know. Holy crap!! Congratulations! I love the subtle announcement! I am terrible about remembering books I’ve read, thus can never remember anything to recommend. Are you on good reads? You should set up a fakey account to join with all of your bloggy friends. Ew…that was one too many -y words in that sentence. First, congratulations. I thought for a moment I was having Monday stupor and had missed some post from you in the recent past. I had create a ‘to be read’ shelf in my house, which is now two shelves. 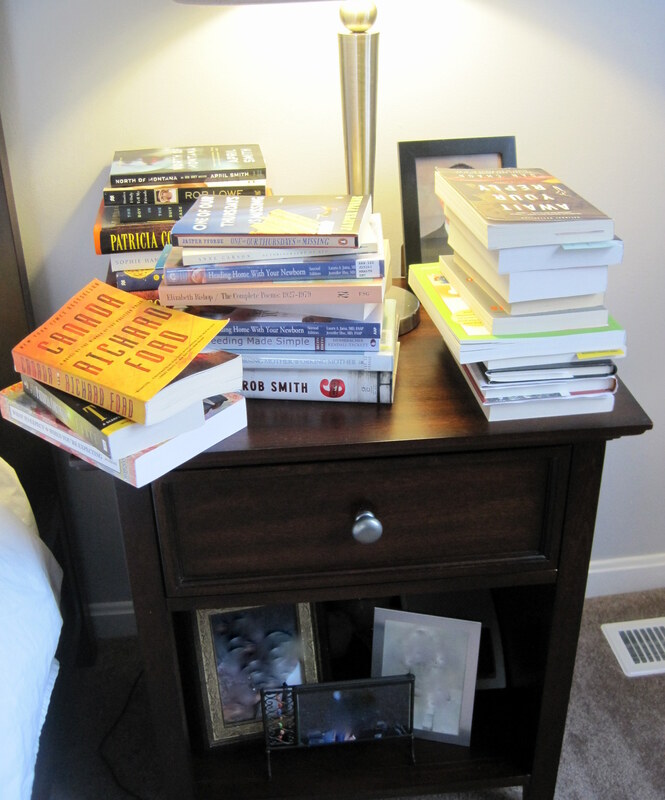 My husband on the other hand can’t keep a book on his nightstand for more than a day before it is done. He doesn’t understand why I have over 30 books that I own and haven’t read. I was the same, Beylit. Like…how did I miss this? There must have been some announcement I missed! But apparently this IS the announcement and I love it!! I like sneaky announcements and LOVE books, so excellent job:) Congratulations!! I was sitting there thinking, “Is she really not going to address this! ?” Congrats! I have been reading a lot lately, but for some reason the only one I can remember right now is “The Thirteenth Tale.” Just in case you are looking for a book recommendation. I was like… “wait… did I miss something?” after looking at your stack of books. Can I ask why you have two copies of “Heading home with your newborn?” haha. Anyway, congratulations! How very sneaky of you! Huge congrats! WHOA!!! Congratulations!! This is awesome! What?! Best non-reveal reveal post ever! Congrats! Congrats!!!! I came over bc Jen said to and holy crap! Welcome to the ranks. 🙂 I wish you all the best. Seabiscuit – Laura Hillenbrand (about the racehorse but a very good humanity story). Let me know if you read any of the above (or already read) and like them. That was a pretty sneaky surprise in there. Congratulations!! Despite my recent panic attacks about being a parent, I promise it’s not always this terrifying. It’s pretty much the best thing ever, to be honest. I think it’s just a constant mix of being scared out your mind that you’re doing something wrong, and being so completely obsessed with this wee little person and in love with all the things they do. It’s bizarre. Anyway. I don’t have any good books to recommend, because I haven’t read a single thing since becoming a parent. So… there’s that. But that doesn’t have to be the case! I just got lazy and really, really into seasons of TV shows on netflix. Also, the last book I tried to read is actually young adult fiction. I have a thing for the Percy Jackson books. And the subsequent series that factors in the Roman deities as well. By Rick Riordan. So if you wanted a good, light and easy recommendation, uhh. There’s that. And the only reason I didn’t finish the most recent book (Mark of Athena), is because I was reading it on the treadmill… and well, that’s stopped lately too…. Ah, congratulations! That’s a reading topic I don’t have any input on at the moment, but I do know this issue of acquiring more and more books before I’m done with the others. One of my goals before I turn 30 is to completely clear my “to read” shelf… which led me to finally read City of Thieves, and it was a shame I waited so long. It’s great! Congrats! I can’t really help because I can’t do the whole reading-multiple-books-at-one-time thing. I gotta finish one at a time. Congrats!! 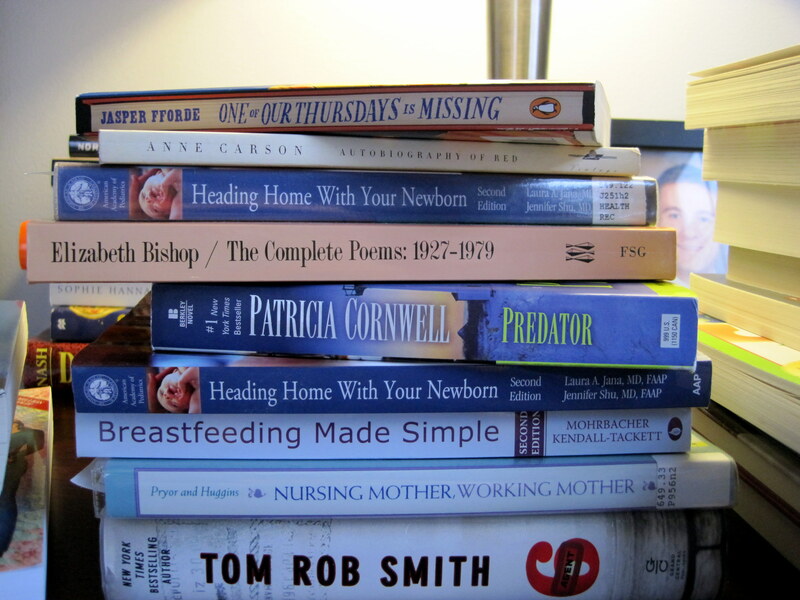 Because, basically the only thing I got from all of those book piles was that there was a strategically placed baby-themed book in each. And then the tag. It will be soooooo much fuuuuuun! Also, I LOVE Unconditional Parenting by Alfie Kohn. You’d better hurry up with a details post. I have been looking forward to that. Awesome news you sneaky sucker!!! It took me a minute, but then I was like, whaaaaaa?? Can’t wait for more details!! That was the sneakiest announcement ever. So sneaky that i totally missed it until you mentioned being pregnant in your next post and i was like whaaaaaaaaa? Super congrats! Cant wait to hear more! Oh my goodness, I was so excited to write book recommendations that I missed the pregnancy announcement! CONGRATULATIONS! I highly, HIGHLY recommend everything by Ellen Emerson White. My FAVORITE of hers is “Long Road Home.” Rebecca is such a strong woman. I loooooove that book. Or you could start with “The President’s Daughter.” This book has a cool history – it was a short little Scholastic book (I got mine from a classroom Scholastic catalog in 6th grade in 1991) and EEW edited it in 2008 to be more modern and it tripled in length. There are three others after that one. SO GOOD. I can hear the dialogue as I read it. She’s so in touch with how people actually speak. If you need funny, “The Spellman Files” by Lisa Lutz are hysterically funny. There are several sequels too and the stories just get better. Also really funny is “The Actor and the Housewife” by Shannon Hale. I laughed out loud a LOT and there are some surprising little plot twists. And finally, if you like historical fiction, my favorite is “Celia Garth” by Gwen Bristow. Revolutionary War, for the win! So, I’m behind, and when I’m scrolling through your posts to find the announcement post I scrolled right past this one, because this obviously wasn’t it. I mean I SEE the books, but are we discussing the books? Anyway, CONGRATULATIONS! Now, I need to offer my advice on a glider. I haven’t caught up on blogs lately, so a belated congratulations to you…though I was already pretty sure you were pregnant, due to your writing hiatus 😉 Baby book wise, I also have Heading Home with your Newborn. In addition, Eat Sleep Poop, the Mayo Clinic Guide to a Healthy Pregnancy and The Happiest Baby on the Block (the dvd version, actually) are on my shelf. Several of my friends loaned me their copies of What to Expect, but I haven’t delved into them. Many, many congratulations! Excited to see your journey unfold. And sorry I’m so behind 🙂 Eagerly going back to google reader to see what else you’ve posted! You read a lot of books. Good for you.